Twenty-eight narrative and documentary films have been announced for the 28th Israel Film Festival in Los Angeles. Reveling in its greatest popularity and acceptance both critically and commercially, these diverse Israeli features, thought-provoking documentaries and television shows will all be celebrated at the largest showcase of Israeli films in the United States. The Festival runs October 23-November 6 at the Laemmle Music Hall 3 (Beverly Hills), Laemmle Town Center 5 (Encino) and Laemmle NoHo 7 (North Hollywood), with special events at the Steve Tisch Cinema Center in the Saban Theatre and the Writers Guild Theatre. The programming was revealed by Meir Fenigstein, IFF’s founder and executive director, noting this year’s Festival showcases an extraordinary year in Israeli cinema. As previously announced, two of the foremost and prolific film producers – who have the number one box office movie for the past two weekends – have been selected for special recognition. Producers Arnon Milchan (Gone Girl) and Mace Neufeld(The Equalizer) will be honored on opening night with Milchan receiving the 2014 Israel Film Festival Visionary Award and Neufeld receiving the 2014 Israel Film Festival Lifetime Achievement Award. Additionally, renowned Israeli actress Dana Ivgyhas been named to receive the Israel Film Festival Cinematic Achievement Award for her amazing, unprecedented and extraordinary double whammy of a dual win at last month’s Ophir Awards, the Israeli film awards, where she won both the Best Actress and Best Supporting Actress Awards for two separate, distinct feature films. Milchan, founder of New Regency Productions, is one of the most successful independent film and TV producers with over 100 feature film credits including L.A. Confidential, which he received an Academy Award® nomination for producing, and 12 Years a Slave the 2014 Academy Award®-winning Best Picture. His other credits include Pretty Woman, The War of the Roses, J.F.K., A Time to Kill, Free Willy, The Client, Fight Club, Alvin and the Chipmunks, Mr. and Mrs. Smith, and most recently Noah, Gone Girl and Birdman starring Michael Keaton. Neufeldis one of Hollywood’s most respected producers. He has produced two of the industry’s most successful film franchises, The Omen trilogy and the four blockbusters based on the “Jack Ryan” series of novels by Tom Clancy, which included The Hunt for Red October, Patriot Games, Clear and Present Danger and The Sum of All Fears. His other credits include The General’s Daughter, No Way Out, Invictus, The Frisco Kid,The Saint and most recently Jack Ryan: Shadow Recruit and The Equalizer starring Denzel Washington. Ivgy won her 2014 Best Supporting Actress honor with Next To Her, which will serve as the Opening Night Film at this year’s Festival. A compelling drama about the triangle of two sisters – one mentally-challenged – and a man that enters their lives,Next To Her had its debut earlier this year at the Cannes Film Festival Director’s Fortnight section. Ivgy and the film’s producer, Estee Mecklberg, will be in attendance and later participate in a Q&A. Additionally, this year the Festival will pay homage to producer Menachem Golan, who recently passed away. 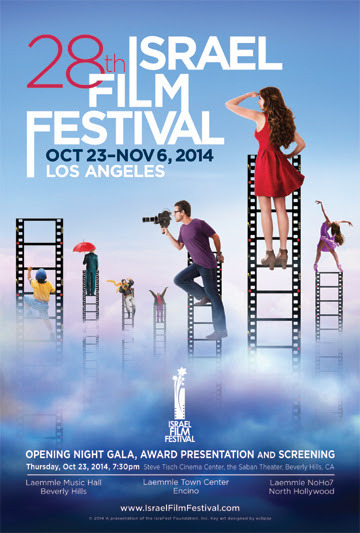 On Thursday, October 30th, the IFF will host the U.S. Premiere of The Go-Go Boys: The Inside Story of Cannon Films as the Festival’s Centerpiece. This fascinating insider documentary about the two Israeli producers – Golan and his cousin, Yoram Globus - who turned the Hollywood power structure upside down, had its World Premiere in May as a Cannes Classics Selection at the Cannes Film Festival. Moreover, in addition to the tribute screening, a panel discussion about the life and times of Golan will occur at the Writers Guild Theatre with those who have known and worked with the filmmaker. A Q & A with the film’s Director, Hilla Medalia, will also occur. Other highlights of a wide-ranging schedule include a screening of the autobiographical documentary Life as a Rumor, which offers a celebration of the late Assi Dayan, son of famed Israeli General Moshe Dayan and one of Israel’s most prominent film directors and actors; and the extraordinary true story of Above and Beyond, produced by Nancy Spielberg. All Israel Film Festival films will screen at the Laemmle Music Hall 3 in Beverly Hills, the Laemmle Town Center 5 in Encino and the Laemmle NoHo 7 in North Hollywood. For nearly three decades, the Festival has presented over 900 feature films, documentaries, television dramas and short films to 950,000 filmgoers and brought hundreds of Israeli filmmakers to the U.S. to share their art. The Israel Film Festival is produced by IsraFest Foundation, Inc., a non-profit organization created in 1982. Among the Sponsors of the 28th Israel Film Festival are long-time partners The IAC (Israeli American Council), Israel Film Fund, Eclipse, Clear Channel, Maurice Marciano Family Foundation, Bank Leumi USA, Four Seasons Hotel, The Beverly Hilton, IDB Bank, The Rabinovitch Film Fund, Adelson Medical Research Foundation, Montage Beverly Hills, New Regency Productions, Relativity Media and the Israeli Consulate in Los Angeles. Winner – Best Supporting Actress (Dana Ivgy) Israeli Academy (Ophir) Awards, 2014. Selected for the 2014 Cannes Film Festival Director’s Fortnight, 2014. Winner – Best Director & Best Actress (Dana Ivgy) Israeli Academy (Ophir) Awards, 2014. Winner of the 2014 Tribeca Film Festival Best Narrative Feature award and the Nora Ephron Prize. Official Selection – Haifa International Film Festival, 2014. Best Picture nominee - Israeli Academy (Ophir) Awards, 2014. Best Picture nominee - Israeli Academy (Ophir) Awards, 2013. Best Feature Documentary nominee - Israeli Academy (Ophir) Awards, 2014. Best Drama Series - Israeli Television Academy Awards, 2013. Best Short Documentary nominee - Israeli Academy (Ophir) Awards, 2014. Winner – Best Short Documentary - Israeli Academy (Ophir) Awards, 2014. Best Short Drama nominee - Israeli Academy (Ophir) Awards, 2014.